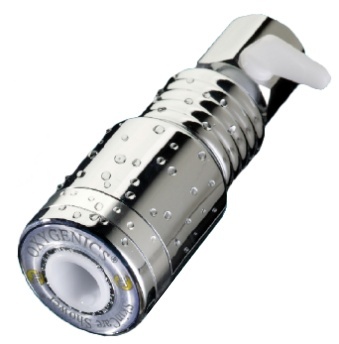 This Oxygenics™ shower head delivers it's strong spray with an ajustable rate control lever. The elegant chrome finish matches the other fixtures in your bathroom. Purchase this item for $29.95. The World's first self pressurizing shower fixture that adapts to low and variable water pressure. Designed to save 30-70% of water used by traditional shower fixtures, the Oxygenics™ SkinCare(TM) shower ensures a superior and refreshing shower experience, everytime. These adjustable flow shower heads are the only high-caliber fixtures on the market with the complete package - a powerful self- pressurizing sensational shower spray, a reduced water and energy bill, and a sleek durable design. The core of Oxygenics™ showerheads are made of Delrin™, an acetal resin similar to Teflon™, providing the required strength, toughness, and resistance to corrosion and scale buildup that is necessary to ensure long lasting performance. The moment you turn on the Oxygenics™ SkinCare(TM) shower you'll realize this is like no other showerhead you've ever experienced. Oxygenics™ will be your shower choice for life.